For myself, too, the death penalty is an archaic practice, a vestige with no place in a 21st-century world. In the arena of constitutional law, the death penalty amounts to ‘cruel and unusual’ (inhumane) punishment. In the arena of ethics, the death penalty is an immoral assault on human rights, dignity, and life’s preeminence. Through the millennia, social norms habitually tethered criminal punishment to ‘retribution’ — which minus the rhetorical dressing distils to ‘revenge’. ‘Due process of law’ and ‘equal protection under the law’ were random, rare, and capricious. In exercising retribution, societies shunted aside the rule of authentic proportionality, with execution the go-to punishment for a far-ranging set of offenses, both big and small — murder only one among them. In some societies, matters like corruption, treason, terrorism, antigovernment agitation, and even select ‘antisocial’ behaviours likewise qualified for execution — and other extreme recourses — shades of which linger today. Resort through the ages to state-sanctioned, ceremonial killing (and other severe corporal punishment) reflected the prevailing norms of societies, with little stock placed on the deep-rooted, inviolable value of human life. The aim was variously to control, coerce, impose suffering, and ultimately dehumanise — very much as enemies in war find it easier to kill if they create ‘subhuman’ caricatures of the enemy. Despite the death penalty’s barbarity, some present-day societies retain this remnant from humanity’s darker past: According to Amnesty International, twenty-three countries — scattered among the Asia-Pacific, Africa, the United States in the Americas, and Belarus in Europe — carried out executions in 2016; while fifty-five countries sentenced people to death that year. But condemnation of the death penalty does not, of course, preclude imposing harsh punishment for criminal activity. Even the most progressive, liberally democratic countries, abiding by enlightened notions of justice, appropriately accommodate strict punishment — though well short of society’s premeditatedly killing its citizens through application of the death penalty. The aims of severe punishment may be several and, for sure, reasonable: to preserve social orderliness, disincentivise criminal behaviour, mollify victims, reinforce legal canon, express moral indignation, cement a vision of fairness, and reprimand those found culpable. Largely fair objectives, if exercised dispassionately through due process of law. These principles are fundamental and immutable to civil, working — and rules-based — societies. Nowhere, however, does the death penalty fit in there; and nowhere is it obvious that death is a proportionate (and just) response to murder. Let’s take a moment, then, to look at punishment. Sentencing may be couched as ‘consequentialist’, in which case punishment’s purpose is utilitarian and forward looking. That is, punishment for wrongdoing anticipates future outcomes for society, such as eliminating (or more realistically, curtailing) criminal behaviour. The general interest and welfare of society — decidedly abstract notions, subject to various definitions — serve as the desired and sufficient end state. Alternatively, punishment may be couched as ‘deontological’. In that event, the deed of punishment is itself considered a moral good, apart from consequences. Deontology entails rules-based ethics — living under the rule of law, as a norm within either liberal or conservative societies and systems of governance — while still attaining retributive objectives. Or, commonly, punishment may be understood as an alliance of both consequentialism and deontology. Regardless of choice — whether emphasis is on consequentialism or deontology or a hybrid of the two — the risk of punishing the innocent, especially given the irreversibility of the death penalty in the case of discovered mistakes, looms large. As such, the choice among consequentialism, deontology, or a hybrid matters little to any attempt to support a case for capital punishment. Furthermore, the meting out of justice works only if knowledge is reliable and certain. That is, knowledge of individuals’ culpability, the competence of defense and prosecutorial lawyers, unbiased evidence (both exculpatory and inculpatory), the randomness of convictions across demographics, the sense of just desserts, the fairness of particular punishments (proportionality), and the prospective benefits to society of specific punitive measures. Broadly speaking, what do we know, how do we know it, and the weight of what counts — epistemological issues that are bound by the ethical issues. In many instances, racial, ethnic, gender, educational, or socioeconomic prejudices (toward defendants and victims alike) skew considerations of guilt and, in particular, the discretionary imposition of the death penalty. In some countries, politics and ideology — even what’s perceived to threaten a regime’s legitimacy — may damn the accused. To those sociological extents, ‘equal protection of the law’ becomes largely moot. Yet at the core, neither consequentialism — purported gains to society from punishment’s outcomes — nor deontology — purported intrinsic, self-evident morality of particular sentences — rises to the level of sufficiently undergirding the ethical case for resorting to the death penalty. Nor does retribution (revenge) or proportionality (‘eye for an eye, tooth for a tooth’). After all, whether death is the proportionate response to murder remains highly suspect. Indeed, no qualitative or quantitative logic, no matter how elegantly crafted, successfully supports society’s recourse to premeditatedly and ceremoniously executing citizens as part of its penal code. There is no public-safety angle, furthermore, that could not be served equally well by lifetime incarceration — without, if so adjudged, consideration of rehabilitation and redemption, and thus without the possibility of parole. Indeed, evidence does not point to the death penalty improving public safety. For example, the death penalty has no deterrent value — that is, perpetrators don’t first contemplate the possibility of execution in calculating whether or not to commit murder or other violent crime. The starting position therefore ought to be that human life is sacrosanct — life’s natural origins, its natural course, and its natural end. Society ought not deviate from that principle in normalising particular punishments for criminal — even heinously criminal — behaviour. The guiding moral principle is singular: that it’s ethically unprincipled for a government to premeditatedly take its citizenries’ lives in order to punish, a measure that morally sullies the society condoning it. Society’s applying the death penalty as an institutional sentence for a crime is a cruel vestige of a time when life was less sacred and society (the elite, that is) was less inclined to censor its own behavior: intentionally executing in order, with glaring irony, to model how killing is wrong. Society cannot compartmentalise this lethal deed, purporting that sanctioned death penalty is the exception to the ethical rule not to kill premeditatedly. Indeed, as Salil Shetty, secretary-general of Amnesty International, laconically observed, ‘the death penalty is a symptom of a culture of violence, not a solution to it’. Although individuals, like victim family members, may instinctively and viscerally want society to thrash out in revenge on their behalf — with which many people may equally instinctively and understandably sympathise — it’s incumbent upon society to administer justice rationally, impartially, and, yes, even dispassionately. With no carveout for excepted crimes, no matter how odious, the death penalty is a corrosive practice that flagrantly mocks the basis of humanity and civilisation — that is, it scorns the very notion of a ‘civil’ society. The death penalty is a historical legacy that should thus be consigned to the dustbin. States, across the globe, have no higher, sober moral stake than to strike the death penalty from their legal code and practices. With enough time, it will happen; the future augurs a world absent state-sanctioned execution as a misdirected exercise in the absolute power of government. Thank you for sharing this post, Keith. I think you speak too vehemently against those who "instinctively and viscerally want society to thrash out in revenge"... for victims and their families, the shadow cast by a murderer is longer because they may be 'out' in a few years. For me the crucial issue is the competence of the state to judge issues and determine guilt. I don't think anyone can really argue for that. It is not so long ago that Nelson Mandela was on trial for 'crimes' which carried (potentially) the death penalty. The matter of ‘visceral’ feelings is grounded in what victims’ family members and friends (unsurprisingly) express. Certainly, their desire for retribution is expected, in light of the ache. Most likely very few of us would prove the exception to that instinct. What I attempted to suggest in the essay, however, is that ‘civil’ society has a unique charge and agency to separate the ‘visceral’ from its own self-sanctioned actions — to paraphrase, ‘not to return injustice for injustice’. You’re right, of course, about the perils publicly heaped upon the Nelson Mandelas of the world; however, the submerged portion of the iceberg is the incognito thousands. When somebody (or something) is guilty? Concepts about right and wrong. This seems to connect to the previous article at PI and the next one! Your points, Tessa, are well taken. What does our family, our community, our schools, our religion, our historical antecedents, our legal system — even our biologically hard-wired proclivities and instincts — instill in us by way of parsing what’s right and wrong? It’s a complicated mélange of sources and inspiration — resulting in a ‘moral muscle memory’, if you will — based in a tapestry of culture, language, and a drum-tight tension between what’s universal and what’s relative. These matters frame people’s perceptions of morality in relation to the very nature of decisions and deeds themselves and of their consequences. I think there are multiple issues here. I’ll survey them briefly, with some bravado I might add, as I have not had time for perfectly considered comment. • The ‘empirical debate’ is exceedingly complex. How do we rightly assess the great variety of studies and striking statistics? Say, 800 000 executions following Mao’s rise to power, or a nearly 150% rise in the murder rate after the abolition of capital punishment in the UK. One needs more than anecdotes. • Is it the same Keith Tidman who is published by the US Naval Institute Press on naval operations and combat science? How would that killing machine relate to this post? You previously seemed to endorse extra-judicial killing, insofar as military might is extra-judicial. • A core concern of the post is that we should bring an end to barbarism. The statistics are not simple, and one wonders which ones are useful. Supposing that the nearly 150% rise in the murder rate in the UK is true, is this a rise in barbarism, or a fall? What is barbarism? • Even in the recent past, in many societies, there were not the means to permanently restrain people who were a fundamental threat to the life of all, except death. We now have the means, but do we really? We have a continuum of more or less effective means over time. How do we assess this? • This post takes it as axiomatic that life is pre-eminent, inviolable, and of the highest value. Yet the idea, fairly recent, of the individual being prior to the group does not seem to be such an easy assumption. It has been falling somewhat out of favour. • We have been called homo symbolicum. There is more to us than homo physicalum. In other words, is our approach to capital punishment physical or symbolic? Homo symbolicum gets a ‘fix’ on a constellation of ills through a justice system. What then of ills which would annihilate a society? • The rundown of penology: consequentialism, retribution, and so on, is not nuanced. There are multiple dimensions. Take proportionality, and just one possible angle among many. It is arguably is the most effective rehabilitation, too. Lose a tooth, and you know what it means, that you took somebody else’s tooth. • There is little or no consideration, in this post, for the victims of serious crime. While one can’t be all things to all persons in a short post, compassion for victims seems fundamental. Can the subject be meaningfully addressed without it? • All human institutions are subject to error. Should we abolish them for their potential error? How should we approach this? For instance, every few days on average, US officers kill an unarmed person. Should we strip police officers of guns because their mistakes are so much higher than those made in executions? It might be helpful for me to say where I am coming from. I tend towards a rehabilitative purpose in the punishment of crime (penology). Thank you, Thomas, for taking a moment to share your observations. Let me address, though only briefly, each point you raise. My comments are in the sequence of your list . . .
— Mass murders and genocides, like those on the scale committed by the Khmer Rouge and others, pose a unique category. They would indeed make for an interesting separate essay, given the scale of such outrages. However, that’s not to say that, because of scale alone, a discussion of the death penalty would necessarily take a different turn. — Wars likewise would make for an interesting separate discussion — well worth engaging in. But, given the many nuanced issues in play in a thorough discussion of war, the topic would require its own essay. As, by the way, might the issue of ‘extra-judicial’ killings, such as those notoriously committed by rogue and autocratic governments around the world. — As you suggest, what constitutes ‘barbarism’ might extend to any number of acts. There are innumerable grounds, ranging extraordinarily far and wide, on which to parse the term. But my essay’s purpose was not to venture, distractingly, into all the imaginable ways in which ‘barbarism’ might apply in the world. — An obvious alternative to the death penalty is a life term in prison, without the chance for parole. Life terms serve at least two critical purposes: they punish; and they protect society. As my essay pointed out, ‘condemnation of the death penalty does not . . . preclude imposing harsh punishment for criminal activity’. — It’s possible to conclude that society’s embracing the ‘preeminence’ of human life doesn’t diminish the value of ‘the group’. From an ethics perspective, both categories merit respect — without one having to be at the expense, in some false zero-sum calculation, of the other. — As for symbolism, I’ll repeat the quote (in my essay) from Amnesty International’s Salil Shetty: ‘[T]he death penalty is a symptom of a culture of violence’ — about as symbolic as it gets. It’s hard to wrap my head around the notion that capital punishment is, as you hint at, a ‘fix on a constellation of ills’. — Proportionality — especially in the context of a ‘tooth for a tooth’ — can very quickly slip into the farcical, such as a penal system physically beating someone who assaulted a victim (the examples of proportionality being too literal and extending too far are endless!). To paraphrase Socrates, perhaps society shouldn’t ‘return injustice for injustice’. — Everyone undoubtedly fully sympathises and empathises with the victims of serious crime. Their (probably unquenchable) ache and anger, including a yearn for retribution, are natural and understandable. All evidence is that the public gets it. However, defining and then acting on notions like ‘retribution’ and ‘sufficiency’ and ‘proportionality’ is quintessentially challenging. Societies are still coming to grips with that. — The puzzling notion that because ‘all human institutions are to subject to error . . . we should [therefore] abolish them’ is probably best left to stand on its own. Other than to say that, in most cases, reform is typically better than abolition. Again, thanks for the opportunity for this further discussion. Thank you, Keith, for a comprehensive answer. Let me (try to) clarify the point on homo symbolicum. 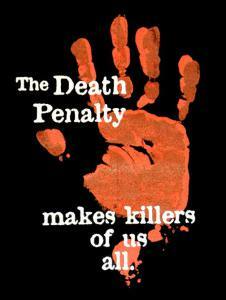 One can discuss the death penalty in fairly basic terms, such as its brutality, or its deterrant effect, and so on. Or one may discuss it in more symbolic terms. My own 'symbolic' suggestion is this: for the functioning of society as a whole, one needs to be able to survey its 'constellation', as it were. Here, the criminal justice system helps a nation understand a) how the nation is functioning as a whole, and b) what gravity it assigns to various crimes. It gives society a picture of itself, without which it would be fairly much in the dark. Now presumably the justice system would, symbolically, assign the highest degree of gravity to crimes which threaten to annihilate society itself. In such a case, how is such crime symbolised in the criminal justice system? I hope that makes some sense. But again, to take in the wide angle, should one distinguish between a more basic discussion and symbolic discussion, and how would symbolic language apply to capital punishment? I loved this movie. Specially the part of the women leadership that was created in the movie after being oppressed. Though women have to face a lot of problems in real life, there is a miracle called safe gender selection natural. This method is a savior to those who are facing problems in fertilization.